The Windows 10 Creators Update is making it easier to understand what information the operating system wants. There are all kinds of new features in the Windows 10 Creators Update rolling out on April 11, but one change really sticks out: greater transparency about the data that Microsoft collects from your PC. There are new dashboard screens that all Windows 10 users will see the first time they install or upgrade to the Creators Update. Perhaps more interestingly, for the first time Microsoft has detailed information about the user data it collects for diagnostics. 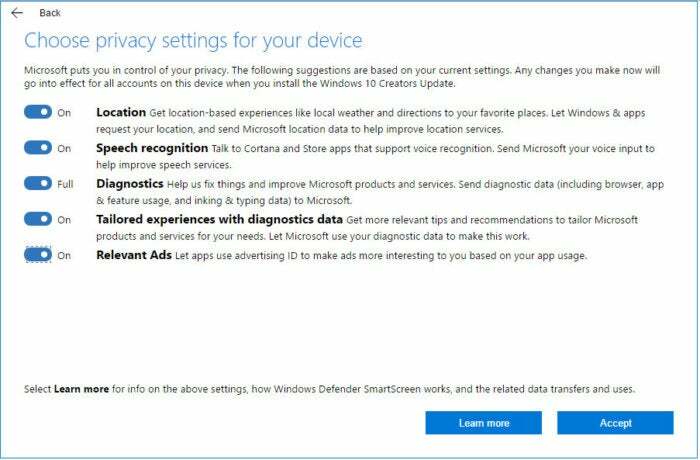 Let’s start with the diagnostics collection, as Microsoft’s come under heavy fire from privacy advocates for refusing to allow users to disable it completely while simultaneously refusing to detail exactly what information Windows 10 collects from users. Microsoft published two Technet pages describing the data Microsoft collects from users on the Creators Update. There are two levels of diagnostic data: basic and full. The information is quite detailed and we won’t get into it here, but if you’re interested, you can find all the nitty-gritty details in those links. Note that while the Basic listing reveals all, the Full listing is a summary of the kinds of data that setting collects. Both dashboards show the same information but are arranged differently. 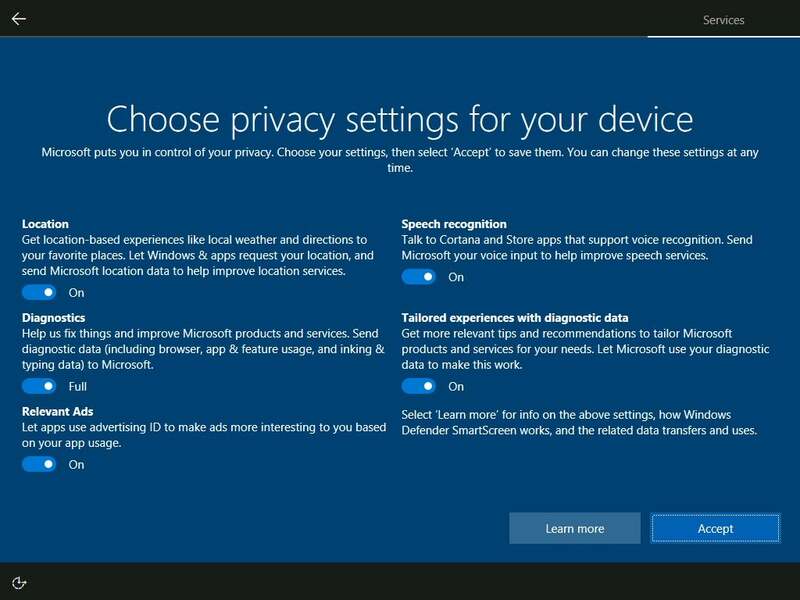 Windows 10’s privacy dashboard at installation. The first-time installation version is a full-screen experience with a blue background similar to other installation screens. Current Windows 10 installs will see what looks like a Settings app screen that shows up after scheduling a Creators Update upgrade. There are five privacy options that include: Location, Diagnostics, Relevant Ads, Speech recognition, and Tailored experiences with diagnostic data. That last item is a fancy way to say “tips and recommendations,” or as most Windows 10 users call it, “stuff I don’t want.” Each screen also has a Learn more button to get detailed information about the privacy settings if the short descriptions aren’t enough. The Creators Update privacy dashboard during an upgrade. Windows 10 Mobile users will see a similar privacy dashboard, though phones have a cellular data toggle and no tailored experiences option. 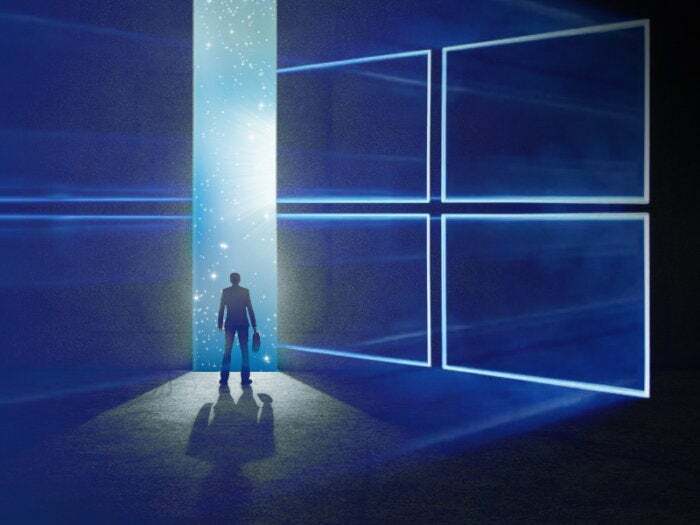 Why this matters: With Windows 10’s focus on Windows as a service and built-in cloud-based features like Cortana, the company has stirred a lot of privacy concerns. This new transparency gives users a better sense of what information is being collected—and why. The new privacy dashboards also put in one place most of the personal information the operating system wants to use on a regular basis. It’s a smart move on Microsoft’s part. As the Creators Update rolls out we’ll see whether this new information puts users at ease or just increases the concerns over data collection.